This review is uncannily well timed for me. I susepect we were reading Muir and More at the same time. I'm a fan of Turnbulls writing. I find I have to be in the right mood since, as you say, you have to stay tuned in to get the message. Yes its only a little book, but I found, as with his other books, that it takes time to read. I often have to retrace my steps. Unfortunately I'm almost through the Turnbull books. Fortunately I still have the riddle of the sphinx to go. I intend to savour it! I read 'Muir and More' a couple of weeks ago and thoroughly enjoyed it too and enjoyed Turnbull's quirky style. 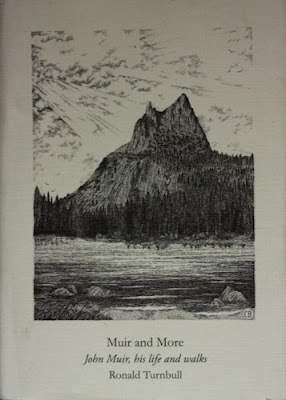 Will go and walk the John Muir Way after Easter and will be on the john Muir Trail, albeit briefly in September (walking the South Lake - Bishop Pass - JMT - Piute Pass - North Lake loop from Bishop). I was glad to run across this review, as I am reading A Passion for Nature" right now. Your review made me want to read this book, which is what a good book review should do. Thanks!